News Corp Australia has announced the launch of the Shine Awards, a partnership between regional newspaper The Weekly Times and Harvey Norman. The Shine Awards will celebrate the achievements and contribution of women across rural and regional Australia. Penny Fowler, chairwoman of the Herald and The Weekly Times and a News Corp Australia community ambassador, said: “I am thrilled to see the award concept come to life, something which originated from a conversation with Harvey Norman chief executive Katie Page on how we could lift the profile of rural women in this country. “We are delighted to be partnering with Harvey Norman on the Shine Awards, which will celebrate and recognise women across rural and regional Australia who are making a real difference in their community. Harvey Norman CEO Katie Page said: “The Shine Awards is the start of something big. We know from the work within our regional and rural stores that the women in these communities are a powerhouse. “Now is the time to let the light shine on the women that you know who are deserving of recognition, whether it is your mother, your sister or friend. The Weekly Times editor Natalee Ward said: “Women make up just over 50 per cent of Australia’s population. They contribute about 49 per cent of the total production of rural communities, and make up 40 per cent of Australia’s farmers. “Yet, when it comes to the number of women making the news in farming or important rural issues, these figures have a tendency to plummet. “Much work is already being done to correct this, but it’s time these stories were told. “There’s a cast of women working across rural and regional Australia, women whose passion and belief in their work illustrate just what it takes to achieve, whose grace and spirit show how such characteristics bring success, and whose courage and dedication will undoubtedly inspire others to stand up and make their own mark. “That’s where the Shine Awards will play a significant role, as it’s the opportunity to tell their stories. “We will uncover stories, events and women in the community who have made an impact to the everyday lives of those around them, and we will encourage story sharing from our loyal audiences through print, digital and social. The awards kicked off in/on The Weekly Times on last Wednesday with a four-page wrap of the paper, digital execution and an extensive social media strategy. 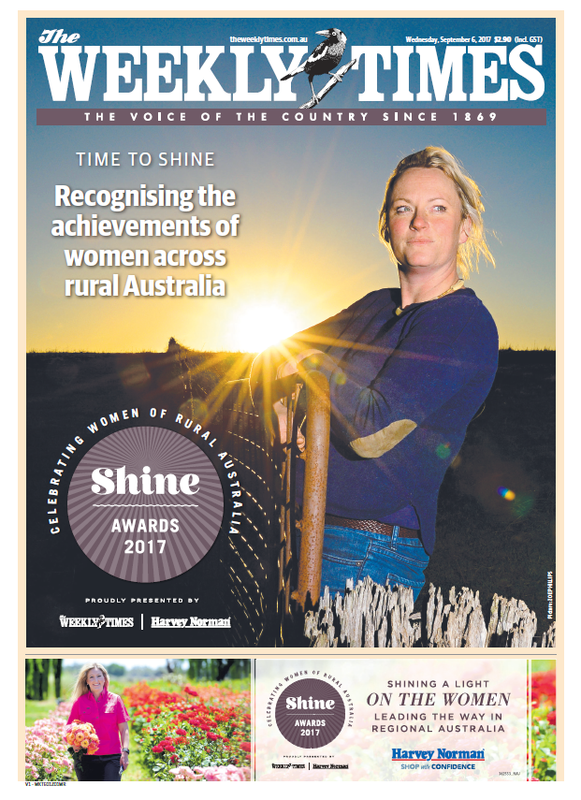 Over the next 12 weeks, The Weekly Times, Rural Weekly and Tasmanian Country, as well as other News Corp titles across print and digital, will highlight the outstanding work being done by women on farms and off them, in rural towns across Australia, in community groups and sporting clubs, in businesses, schools and homes. The awards will culminate with a special 32-page magazine in The Weekly Times on Wednesday 22 November to announce the award winners in six categories: Vision; Dedication; Spirit; Belief; Grace and Courage. Each winner will be awarded a $2,500 voucher from Harvey Norman. From these six, one will be named the Shine winner and awarded $5,000. The Shine Awards will now become a vital part of The Weekly Times awards program, following Coles’ recent three-year commitment to The Weekly Times Coles Farmer of the Year Awards.